Cyber attacks targeting a little known internet infrastructure company disrupt access to dozens of websites. SAN JOSE, CALIFORNIA, UNITED STATES (REUTERS) - Hackers unleashed a complex attack on the internet through common devices like webcams and digital recorders and cut access to some of the world's best known websites on Friday (October 21), a stunning breach of global internet stability. Jay Kaplan of the security company Synack said denial of service attacks shouldn't expose vulnerable data. "Denial of service attacks certainly don't instill confidence. But at the same time they don't necessarily cause data to be vulnerable. Right? We're talking about Web sites going down. We're talking about data not necessarily being able to be accessed. But at the same time, hackers are not able to get access to that data themselves. We're really just limiting the ability to perform normal functions over the internet," he said. Friday's outages were intermittent and varied by geography. Users complained they could not reach dozens of internet destinations including Mashable, CNN, the New York Times, the Wall Street Journal, Yelp and some businesses hosted by Amazon.com. South Korea's economic growth is still expected to meet the government's expectations this year, according to the deputy finance minister, but recent strikes at Hyundai Motor Co and the discontinuation of Samsung Electronics Co Ltd's Note 7 sales pose risks. Ciara Lee reports. 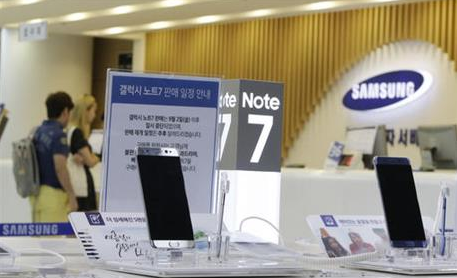 (Reuters) - While growth is expected to meet expectations this year, the government says the scrapping of the fire-prone Note 7 will have a negative impact going forward. Samsung is bracing for a three billion dollar hit over the next two quarters. The total loss for the global smartphone leader is expected to be over 5 billion dollars as a result of the overheating issues. The device that was meant to compete with Apple's latest iPhones was withdrawn from sale less than two months after its launch. Several airlines have now decided to ban it from flights. "Samsung is a global light for South Korea. If you think of South Korea you think of Samsung. You have to take a case in point for example like Volkswagen in Germany. The huge damage that's done to the company and will likely have done to the local economy. Obviously the German and South Korean economies are vastly different but if the Volkswagen problems hurt the German economy, you would have to expect the Samsung ones to hurt the South Koreans." And it's not just Samsung causing concern. The government has warned that strikes at carmaker Hyundai could also hamper growth. A tentative wage pact with the South Korean union has now been reached. But the worst strikes in the company's history coupled with sluggish domestic demand have prompted analysts to slash earnings forecasts. Ringing in tougher times - the impact of South Korea's Samsung saga is beginning to be felt. Sony is developing a new software system containing algorithms that create songs based on existing music and help their arrangement and performance. Jim Drury reports. (REUTERS / SONY CSL PARIS) - It sounds like The Beatles.....but wasn't written by the Fab Four. 'Daddy's Car' was created by Sony's artificial intelligence system Flow Machines, with the aim of sounding like Lennon and McCartney. It was written using algorithms at Sony's Computer Science Lab in Paris. "What the algorithm will do is always try to cope with your constraints, with what you are imposing to the system, to the score, the lead sheet - and the algorithm will always try to repair if you want, or generate stuff that is at the same time compatible with what you imposed and in the same style of the training song set." Each song's starting point is the machine's database of sheet music from 13,000 existing tracks. Users choose a title whose sound or feel they like. The machine does the rest. Professional musician Benoit Carre recorded 'Daddy's Car', along with this track, 'Mister Shadow'. He insists the music created isn't devoid of feeling, despite being artificially created. "We can find a soul in whatever type of music, including that generated by a computer. 1980s music was generated by a synthesiser. Music is what the person makes of it. It doesn't exist alone. Each song is a partition sheet, with a lot of things around it." After the song is created, musicians can write their own parts to broaden the sound. British rock star Peter Hook doesn't like the idea. "Nearly every song I've written, in New Order and outside of New Order, has been with somebody else, and that is the beauty of it. Writing with a machine - what feedback, what buzz, are you going to get from a machine? All machines do is drive you crazy. You're forever turning them off and on. So not for me, mate. I'll stick with people." Sony wants to launch albums with songs created entirely by algorithm - one based on Beatles music. It says the algorithms ensure songs are unique and avoid plagiarism....but admit the issue of songwriting credits could be tricky to determine. LONDON, ENGLAND, UK (REUTERS) - Turning heads at a recent design exhibition in London, the cooking pot heats up from the inside as it spins. Called the Mag Cook, it uses in-built magnets that are spun using a pull-cord, with the rapidly alternating north-south polarities creating an electromagnetic frequency which in turn generates heat. Co-designer Ashley De Garmo says the Mag Cook could offer users freedom from traditional energy sources. "You know, once it's set up it's completely off the grid. You don't have to worry about any other kind of input. You don't have to worry about paying for electricity. Once you have it, then it produces the energy." De Garmo and his team have two prototype designs on display; the cooking pot and this induction ring. He says the simplicity of the technology and its portability mean the Mag Cook could be a valuable tool in scenarios where people have been cut off from power supplies. "That is something where you want it to be portable, but once it's over there you don't want any of this input. You don't want it to be reliant on electricity. You want it to be sturdy and be able to operate. And I see there's a good potential market within disaster relief." De Garmo says the next challenge is to find a mechanism to keep the magnets spinning, and the energy flowing, for as long as it's needed. But he says there are various practical solutions available. "Have it set up being powered by like a windmill or having a weight coming down which would turn the gear. There's a lot of different ways of actually getting that energy into the device." The team says these proof of concept designs show how the technology could lends itself to many applications, including heating in homes and water purification. And in an era of soaring energy bills, the chance to generate heat 'off-the-grid' with magnets, may offer an attractive alternative. NASA's Solar Dynamics Observatory (SDO) captures stunning images of a solar flare which peaked on October 2nd. While intense flares can interfere with GPS and communications signals on Earth, this flare was M-class - just one-tenth as powerful as the biggest ones. IN SPACE (NASA/SDO/WIESSINGER) - NASA's Solar Dynamics Observatory (SDO) has recorded images of a mid-level solar flare, which peaked at 3.01pm EDT (1901GMT) on October 2. The eruption of solar plasma came from an active region on the right side of the sun, according to NASA. Of most concern to scientists is usually the size and direction of the coronal mass ejection (CME) that accompanies such flares. A coronal mass ejection can send billions of tonnes of solar particles into space. If directed towards Earth, that energy can affect electronic systems in satellites and on the ground, although in this case, scientists say the flare was classified as an M7.3 flare. M-class flares are one-tenth as powerful as the most powerful flares, which are designated X-class flares. The instrument recording the images, the SDO, was launched by NASA on February 11, 2010. It is the most advanced spacecraft ever designed to study the Sun. Equipped with a group of four sophisticated telescopes called the Atmospheric Imaging Assembly (AIA), the SDO can observe and transmit highly detailed images of the Sun in different wavelengths. The images coloured in teal are observations made in the 131 Angstrom wavelength, regarded as ideal for visualising material at the very hot temperatures of a solar flare. Microsoft CEO, Satya Nadella, takes criticism for suggesting that women not ask for raises, during a tech conference intended to celebrate the role of women in the computing industry. PHOENIX, ARIZONA, UNITED STATES (OCTOBER 9, 2014) (ANITA BORG INSTITUTE) - Microsoft Corp's chief executive officer suggested on Thursday (October 9) that women in technology should not ask for raises but have faith in the "system", bringing a torrent of criticism and causing the executive to backtrack after the statement. Satya Nadella, who became CEO in February, was asked how women should get ahead in the tech world at a three-day conference in Phoenix, Arizona, intended to celebrate women in computing. "It's not really about asking for the raise, but knowing and having faith that the system will actually give you the right raises as you go along," Nadella said, according to a recording on the website of the event, the Grace Hopper Celebration of Women in Computing. "Because that's good karma," Nadella continued. "It'll come back because somebody's going to know that's the kind of person that I want to trust." Maria Klawe, president of Harvey Mudd College and a member of Microsoft's board, immediately challenged Nadella, saying his viewpoint was "one of the very few things that I disagree with you on," eliciting a few cheers from the audience. The two went on to hug on stage, and the audience warmly applauded, but Twitter rounded on Nadella and his comments became fodder for jokes. "Was inarticulate re how women should ask for raise," he tweeted several hours after his remarks. "Our industry must close gender pay gap so a raise is not needed because of a bias." Nadella also admitted his error in a memo to Microsoft employees which was posted on the company's website. "I answered that question completely wrong," said the memo. "I believe men and women should get equal pay for equal work. And when it comes to career advice on getting a raise when you think it's deserved, Maria's advice was the right advice. If you think you deserve a raise, you should just ask." Only 29 percent of Microsoft's more than 100,000 employees are female, according to data recently released by the company. MEXICO CITY, MEXICO (REUTERS) - Engineers Mexico are keeping pace with the latest advances in wearable technology. Alejandro Garcia and his team from Autonomous University have developed a jacket called "Podium" that allows a runner to keep tabs on their performance and vital signs in real time. The jacket is equipped with a series of sensors that gather data on the users heart rate and body temperature as well as performance info like calorie burn and distance. That data is fed to microprocessor which then relays it to a smartphone via a bluethooth connection. "I think it is relevant there is a jacket that is able to measure elements that are necessary for the runner such as heart rate. The runner will be able to determine if their heart rate goes over a certain limit, the phone will then send a signal or generate an alarm. The same goes for temperature." That functionality allows runners to maximize their performance. Garcia says his team used a waterproof breathable fabric that protects the electronics while keeping the runner comfortable. "We designed several versions of the jacket until we came up with a design that could cover the electronics throughout the human body. A jacket with laser printed water-proof material that allows for holes so that the person running is able to keep cool." Garcia says the jacket is constantly charging thanks to a thin layer of solar panels situated on the runners back. The engineers have already commercialized the design and plan to start filling orders early next year. Mark Zuckerberg pledges Facebook's support to meet India's ambitious program to connect a billion people to the internet and help support the government's education, health and social initiatives. NEW DELHI, INDIA (OCTOBER 10, 2014) (ANI) - Facebook Chief, Mark Zuckerberg, met India's Information and Technology (IT) Minister, Ravi Shankar Prasad, in New Delhi on Friday (October 10), pledging to help the government's Digital India initiative, an ambitious plan to connect a billion people to the internet. India has the second highest number of Facebook users in the world after the United States, but still only about 243 million out of 1.25 billion people have access to internet. "To help out with this amazing Digital India initiative that the administration is focused on, connecting more than a billion people to the internet is going to not only improve the lives of a lot of people in India but helping to spread the innovation and the imagination of the Indian people will help everyone around the world and we are very excited to help out in whatever way we can," said Zuckerberg. Zuckerberg and Prasad also discussed ways in which the social networking giant could help promote education, health and social initiatives throughout the country, which include female empowerment and plans to clean up the River Ganges. "Facebook is willing to work in India in the field of broadband retailing, e-education, e-health and also in the spread of many other government programmes in the manner they have been doing in the other parts of the world," said Prasad. Zuckerberg is in India on a two-day visit to promote the internet.org app that has provided access for many people in underdeveloped areas to basic online services. The Facebook co-founder's arrival in India comes close on the heels of visits by Satya Nadella of Microsoft and Jeff Bezos of Amazon. He is also due to meet Prime Minister Narendra Modi later on Friday. R Reports - Twitter and its dedicated army of users may be getting the last laugh-staging a "digital coup" after Turkey's prime minister- a heavy Twitter user himself- blocked the social media site. The Twitter ban came ahead of bitterly contested elections. Tech-savvy Turks- including the country's own President- quickly found a workaround- with a little help from Twitter itself. "The really fascinating thing now what they are doing is they are spray painting on walls the DNS changes you need to make to re-access Twitter. I mean that is how the public has changed. That is how tech savvy people have become." The hashtag #TwitterisblockedinTurkey among the top trending hashtags in the world. The ban came after Twitter ignored requests to remove content related to a political scandal. But while this incident likely won't impact Twitter's bottom line- it's not the first time politics has gotten in the way of social media- and some countries, like China, are more effective in their bans. "It is a big risk. Certainly because the biggest markets for the social media networks are the developing nations, are the nations where they haven't really built a stronghold or gotten a foothold or - in the U.S. they are saturated, so they are looking outside the U.S. to really grow." "These companies, to a large extent, highlight pretty extensively in the context of public SEC filings that there are risks related to countries and governments that choose to not make these offerings available in a broad sense or in a selective sense. And the fact is, that really we don't see these as very impactful to these companies or their businesses." Twitter says it hopes official service in Turkey can be restored soon. Malaysia (Next Media) - The U.S. Navy has sent its premier surveillance plane to join in the search for the missing Malaysia Airlines Flight 370. The $35-billion Boeing P-8A Poseidon, originally designed to find and sink submarine ships, was first sent to Kuala Lumpur from Okinawa, where six other Poseidons are stationed. From Malaysia, the plane took off to patrol the eastern Indian Ocean. The P-8A is fitted with a maritime radar at its nose, enabling all-weather imaging and classification of ships and submarines. The plane is also equipped with electro-optical and infrared sensors capable of heat detection. A magnetic detector at the tail of the plane serves to identify metallic objects in the ocean by picking up disturbances in the magnetic field. Typically, a creeping line search pattern is employed when the search area is large while an expanding square search pattern is used when the search target is believed to be in a small area. The P-8A is equipped with a number of armaments, including the AGM-88 Harpoon anti-ship missile, but will conduct the Malaysian flight search unarmed. Three Australian and two Japanese surveillance P-3 Orion ships joined the P-8A in the search. A Norwegian merchant ship was also sent to the area on Thursday (March 20) with more ships from the British and the Australian navies to follow over the weekend.